"Paranormal Conferences - Lectures and real ghost hunts"
Have you ever wondered what goes on at a paranormal convention? Attend one in your area and find out for yourself! Back by popular demand! Be a Ghost Hunter for a night while also aiding in the preservation of history. Come investigate the historic and haunted properties of the Mine Au Breton Historical Society in Potosi, MO with PTF. Due to demand, we have added another Overnight Ghost Hunt at Pythian Castle in Springfield, MO for Saturday September 17, 2011. There are also still spots remaining for the Saturday July 16, 2011 Ghost Hunt as well. The Ohio Paranormal Convention is setting a standard in paranormal conventions. We aim to provide the area with some of the best names in all areas of paranormal research, in a way that is different than most conventions. Southern Ohio Paranormal Research and Cryptic Investigations, we will make Dayton Ohio the place to be in 2010 yet again! The convention will take place August 21st & 22nd 2010 at Dayton's Hara Arena. Our focus remains the same, to provide you with the most diverse guest list available. We welcome skeptics and believers alike and hope you will enjoy the diverse guest list we have lined up. For 2010 we have lined up some well known guest speakers who will help make this event even better than we could have ever imagined. you and your friends at three haunted locations. Christopher had his first paranormal experience at the age of seven. He also discovered that he had a definite psychic/medium sense, and began doing remedial paranormal investigations at a mere 12 years of age. Eventually his interest in the paranormal overtook his passion for music, and Moon chose to become a full-time professional investigator. In 2004, Christopher was contacted by an engineer by trade, Frank Sumption, who claimed to have a device that allowed two-way audio communication with the dead. Skeptical, Christopher met with Mr. Sumption at his workshop for a demonstration. Christopher was astounded to find that the device that Frank Sumption had built was actually designed through the E.V.P. (Electronic Voice Phenomena) of deceased scientists. It quickly became obvious to Christopher what Frank Sumption had done; he had completed the infamous Thomas EdisonTelephone to the Dead. The Telephone to the Dead has become an invaluable tool in Christopher's paranormal research. In March 2007, Christopher was invited to lecture about his research at the Ghost ChasersWeekend Conference in Savannah, Georgia. It was at this conference, where Christopher realized his talents using the Telephone to the Dead, would be needed in more than a paranormal research capacity. His presentation quickly turned into a public demonstration of the Telephone to the Dead. One by one, attendees asked to speak with loved ones who had passed. Surprisingly, even to Christopher, these requests were met with comforting, and sometimes vital messages. Dead to many excited students, eager to learn more about the paranormal. His television appearances and interviews include, most notably, truTv Network's "Door to the Dead", NBC's "Today Show", A & E Network's "Paranormal State", and the Travel Channel's "Most Extreme Places to Stay", as well as numerous ABC, CBS, NBC, CW (formally the WB), and FOX affiliate stations around the country. He has appeared on many nationwide radio programs, such as Coast to Coast AM with George Noory, TAPS Radio Beyond Reality, and many more. Join us at the Ghost Hunter Shop, Monday, June 20 and meet Christopher Moon for a reading with the Telephone with the dead. The events will consist of both Gallery and Private Readings with Christopher and the device. Gallery Readings allow the public to hear the incredible story of how the machine was first obtained and used. After the presentation the group is allowed to witness Christopher and the device in action and actually pose questions to the spirit world. Those who have had readings have had amazing experiences contacting loved ones who have passed, direct contact with Angels and Sprit Guides and even detailed accounts of Past Lives. Christopher will also be joined by his mother Paulette who is an intuitive and will provide Empathic Tarot Card Readings during the events. Private Empathic Tarot Card readings by Paulette: $45 per 20 minute reading from 10am - Noon- 5pm. To take advantage of this rare experience please call 859-576-5517 today to book your reading. Since Christopher is only here one day he will book fast. The principal international scientific organization studying parapsychology and the nature of consciousness, the Parapsychological Association (PA) will be hosting its 54th annual convention on August 18-21, 2011 in Curitiba, Brazil. Leading scientists and other academics from around the world will gather to present the latest parapsychological research into psi and other phenomena, such as extra-sensory perception, psychokinesis, psychic healing, altered states of consciousness, mediumship and survival of bodily death. Open to the public and academics alike, with most events in English but simultaneous translation available in English and Portuguese, the PA convention coincides with UNIBEM's 7th Psi Meeting and the 6th Journey into Altered States, adding local academic and experiential dimensions to the combined events. In addition to hosting the largest contingent of PA members and affiliates outside of the US and Europe, Brazil contains a rich diversity of groups and individuals that engage in a range of apparently paranormal approaches to healing. Curitiba, Brazil is a modern city that has attracted attention around the world for its innovations in sustainability. The convention will open with a reception featuring the release of the Portuguese edition of the book Varieties of Anomalous Experience: Examining the Scientific Evidence, first published in 2000 by the American Psychological Association, and edited by psychologists Etzel Cardeña, Steven Jay Lynn, and Stanley Krippner. Ihnvited speakers include Dr. Wellington Zangari, Professor of Psychology at the University of São Paulo and coordinator of INTER PSI, a laboratory conducting studies and interdisciplinary research at the crossroads between anomalistic psychology and social psychology. Dr. Zangari will be speaking about the new horizons in psi research in Brazil. Dr. John Alexander, a leading advocate for the development of non-lethal weapons and a Senior Fellow at the Joint Special Operations University will provide a cross-cultural review of applications of psi phenomena. Dr Michael Winkelman, author of several books on shamanism, psychedelic medicine, and consciousness will deliver the PA’s annual J.B. Rhine banquet address titled, "Evolved Psychology and the Deep Structure of Psi: The Shamanic Paradigm." Dozens of presentations on a variety of parapsychological topics, as well as a panel session on ayahuasca and exceptional human experiences will round off the event. 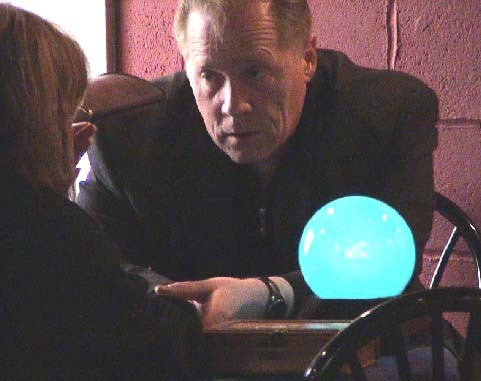 The PA convention will offer an opportunity for attendees interested in that wide range of human functioning popularly known as the ‘psychic’ or ‘paranormal’ to hear the latest and most advanced scientific thinking about parapsychological topics. 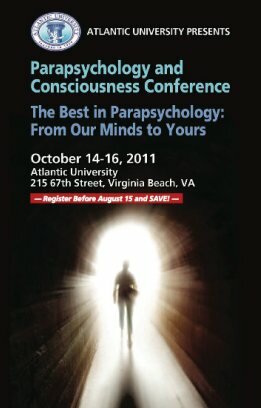 Additional convention information and online registration is available at www.parapsych.org. It is convention season again and I wanted to let IGT members know about the 2011 MidSouth Paranormal Convention! It is August 26-28th at the Fern Valley Hotel and Conference center in Louisville, Kentucky. Rooms are $71 at the convention discount rate, pre-registration is $40 for the weekend or $25 for one day (prices good until August 6th, 2011). At the door prices are $50 for the weekend and $30 for one day. This event is known as the "granddaddy of paranormal conventions" and I hear it is a really neat event. Guests haven't been confirmed yet, but they've had some really big names in the paranormal community as guests before like Tim and Trish Yancy and the Ghostly Talk Radio team. The event is hosted by Louisville Ghost Hunter Society led by Mr. Keith Age. Visit the site here: http://www.louisvilleghs.com/ for more information. of admission anywhere in the country. Sunday, 28 August 2011 5:00 PM EDT! The UPPER PENINSULA PARANORMAL RESEARCH SOCIETY AND KEWADIN CASINO are very proud to present the largest paranormal gathering of its kind in the Midwest! The event titled Pythagoras Conference 2011 starts on Nov.11.2011! Paranormal Conference 2011 in Liberty, Missouri. Sponsored by Paranormal Adventure Radio and PRI Team. Guests of Honor are Carrie Vaughn and Catherynne Valente. Capclave is a small relaxed literary SF/F con that offers panels, readings, gaming, filking, science presentations, autographing, writing workshops, a dealers room, a hospitality suite and room parties. Produced by the Washington Science Fiction Association. The Canadian American Horror Paranormal Convention will see many great speakers from film and television who work in the Horror and Paranormal Genre’s. The convention actually takes place in a hotel that once was the death gallows for some who were hung for the crimes they committed. Those that were still walk the hallways of this building.